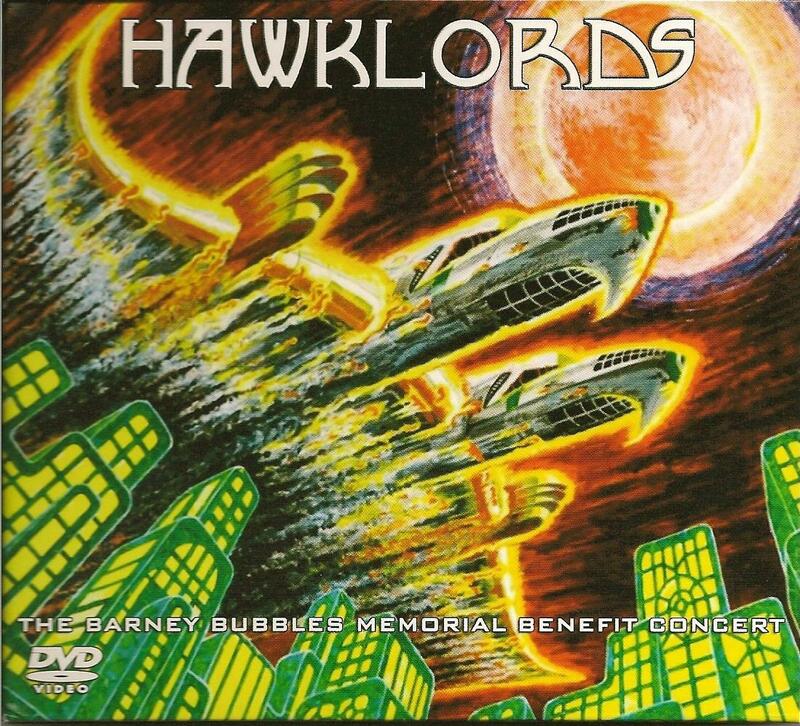 Hawklords - "Barney Bubbles Memorial Benefit Concert"
This show took place on November 29, 2009 at the 229 Club in London, UK. Running time is approximately 95 minutes. If you're a true Hawkfan, like myself, you'll likely get an unlimited number of views from this live concert DVD. As many as concert DVD's that have flooded the market within the last several years, this Barney Bubbles Memorial Benefit Concert DVD definitely does a lot for me - perhaps, it's partially having to do with the superb track listing. Every one of the thirteen songs played here are great - but just to mention some of these tunes I couldn't get out of my head for a spell after seeing this DVD for the first time were Orgone Accumulator (complete with full-on psychedelic light show), a gem of an old school Hawkwind doomsday recital Ten Seconds Of Forever, the Nik Turner signature classic Brainstorm as it features the split-screen effect - as so does the stunning You Shouldn't Do That. Also got plenty out of Master Of The Universe (with dancers - I often say that this is one Hawkwind tune I've long been burned out on - but not this time), one of my all-time Hawkwind favorites Opa-Loka, a much deserving Robert Calvert composition that you don't hear everyday Steppenwolf and the grand finale - Hawkwind's sole million-seller Silver Machine. Nik Tuner co-produced this DVD, as he's noted to state that Barney Bubbles and he were friends from the get-go plus Bubbles was the one who initially came up with Turner's nick name - Thunder Rider. Line-up: Nik Turner - sax, flute & vocals, Ron Tree - vocals, Alan Davey - bass & vocals, Adrian Shaw - bass & vocals, Harvey Bainbridge - synthesizer, Steve Swindells - keyboards & vocals, Jerry Richards - guitar & vocals and Dan Thompson - drums. Sound and picture quality couldn't be better. The DVD comes lavishly housed in a nifty triple fold-out digi-pack accompanied with full color 12-page booklet complete with some rather nice photos as well as song lyrics. I encourage fans who are wanting this DVD to purchase a copy before it becomes an out-of-print title. NOTE that the DVD is in the PAL format. Very much a M-U-S-T have.